Take advantage of great savings opportunities to dramatically reduce your current electricity bill, and entirely eliminate your future bills. Solar energy is a smart, green and clean source of electricity for your home or business. Few investments in your home have the ability to surpass a simple return on investment and go beyond to provide long-term financial benefits. 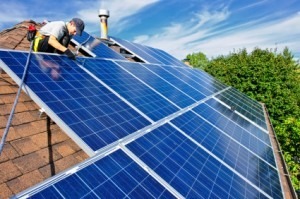 It's a great time to invest in solar energy for your home. First Choice is an A+ rated Better Business Bureau company providing the highest quality on-site installations and service. 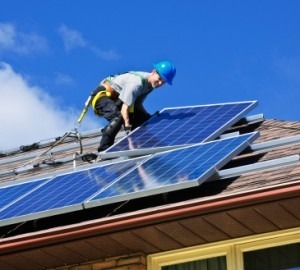 Call us about getting your home equipped with energy-efficient solar power. A solar system in your home or business allows you to produce your own electricity reducing the amount you purchase each month. While being cost consciensous benefits you, your decision to invest in solor energy is environmentally conscienceous and responsible as well. The are substantial offsetting financial benefits in rebates and tax incentives to your investment - reducing the overall investment by as much as three quarters or more. In a time of dramatic reductions in home values, a solar system can significantly boost your home's worth. Photovoltaic Solar Systems create electricity for your home.Our solar panel systems convert sunlight directly into electricity that is input directly into your home or business electrical system. First Choice can plan for and install a system tailed around your home's available installation area and energy requirements. Immediately begin lowering your energy bills by generating your own electricity. For heating the water in your home and swimming pool, First Choice can provide you with a thermal solar system for heating your water, without utilizing energy from your home's electric or gas water heating system. Call First Choice today, or request a quote using our online form here.